A small church in Texas was once declared the richest in America. In the fall of 1917, the Eastland County cotton-farming town of Merriman was inhabited by “ranchers, farmers, and businessmen struggling to survive an economic slump brought on by severe drought and boll weevil-ravaged cotton fields.” Everything changed on October 17, when a Texas & Pacific Coal Company wildcat well struck oil near Ranger, four miles away. 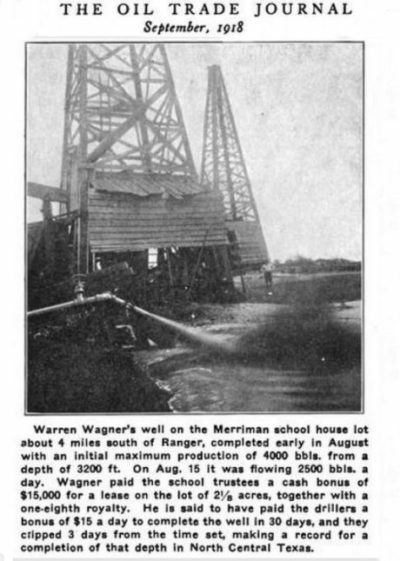 The “Roaring Ranger” gusher of 1917 brought an oil boom to Eastland County, Texas, about 100 miles west of Dallas. The J.H. McCleskey No. 1 well produced 1,600 barrels of oil a day, enough to buy nine new Ford Model-T touring cars every day. The rush to drill in the “Roaring Ranger” field soon became legendary among oil booms, even for Texas, home of the 1901 “Lucas Gusher” at Spindletop. As drilling continued, the potential yield of the Ranger oilfield led to peak production reaching more than 14 million barrels in 1919. Deacon J.T. Falls (second from left) was not amused when the Associated Press reported his church had refused a million dollars for the lease of the cemetery. But drilling in the church graveyard was a different matter. 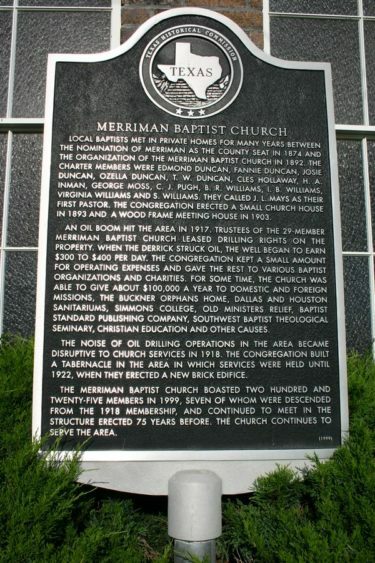 A 1999 Texas State Historical Society marker explains how members of the Merriman Baptist Church generously shared oil royalties. Deacon J.T. Falls was not amused. “A great many clippings have been sent to us from many secular papers to the effect that we as a church have refused a million dollars for the lease of the cemetery. We do not know how such a statement started,” he opined. A lack of knowledge about the young science of petroleum geology defused the issue. Roaring Ranger’s oil production dropped precipitously because of dwindling reservoir pressures brought on by unconstrained drilling. Despite another oilfield discovery at Desdemona, by 1920 the Eastland County drilling boom was over. Many exploration and production companies failed (including fraudulent ones like Hog Creek Carruth Oil Company). But today, a faithful congregation still gathers at Merriman Baptist Church every Sunday. In the decades since the McCleskey No. 1 well, advancements in horizontal drilling technology have presented new legal challenges to mineral rights of the interred, according to Zack Callarman of Texas Wesleyan School of Law. Callarman wrote an award-winning analysis of laws concerning drilling to extract oil and natural gas underneath cemeteries. His “Seven Thousand Feet Under: Does Drilling Disturb the Dead? Or Does Drilling Underneath the Dead Disturb the Living?” was published in the Real Estate Law Journal in 2014.